There’s nothing mezza (halfway) about Mezzatorre. If you don’t leave feeling completely refreshed and absolutely rested, try the thermal mud wrap next time. The inhabitants of Ischia once gathered in the old stone tower to defend themselves against marauding Saracens. Now visitors come from far and near to defend themselves against the ravages of stress and time. Mezzatorre has made the restored 15th-century tower an enticing stronghold of serenity and rejuvenation, a place where it’s easy to rediscover your essential self. It helps that the island resort is just far enough removed from the world to enjoy fabulous views of the Gulf of Naples and Vesuvius and yet easy access to spots like Capri and Positano when guests desire a diversion. 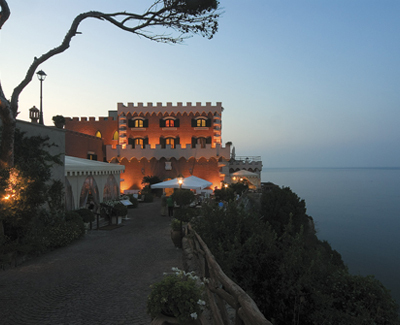 It helps that Mezzatorre commands its own promontory, with a beautiful cliff-edge seawater pool above, a private rocky beach below, and quietly elegant accommodations in the tower itself as well as in small buildings scattered among the pines. But the core of its appeal is a staggering array of health and beauty treatments. Try the famed Ischian mud bath followed by a thermal shower, or maybe the spring water mud mask or lymphatic drainage. Perhaps you’d prefer a firming beauty massage, then an eye contour treatment and a manicure. Weekend, three-day, and seven-day packages make it easy to combine a variety of treatments for an utterly relaxing experience. In between, you can expend some of your returning energy on the tennis court, the jogging track, or enjoy water sports, sample regional and international specialties seasoned with sea views, or wander down to the village of Lacco Ameno for a cappuccino and a change of scenery.